The Kolinsky (Mustela Siberica) is a species of the Mink family, a member of the Weasel clan and a native of Siberia and northeast China. There is no doubt Kolinsky is the best hair available for the manufacture of artists’ brushes due to being conical in shape, strong in character with a long tapered point and thick belly. 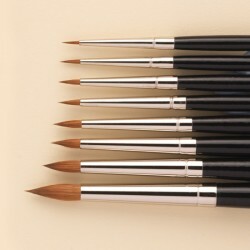 The excellent snap & spring together with immense liquid holding capacity make them a first choice for watercolourists. The high cost of the hair being the only major drawback (usually weight for weight three times the price of gold). Once used however the difference compared to others is well worth the difference in price. Consider Kolinsky Sable a long term investment. Personally as a brushmaker this is my absolute favourite hair to work with, indeed a privilege.